One of the biggest adventures in my life included a recent trip to Angel Falls. Angel Falls is very deep in Venezuela. First there was getting to Venezuela. The cheapest way we found was to go through Curacao. With a friend we arranged an overnight van transport from Caracas to Ciudad Bolivar airport, and from there we flew on a small plane to Canaima, the absolute edge of any sort of civilization. 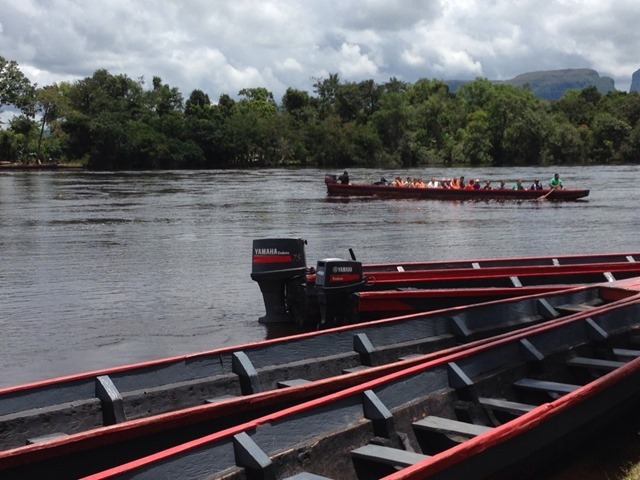 The area we flew into is a crossways of a number of Amerindian tribes where the river is the road. From that point we met up with our native guides. At the local market, call it arrivals and departures where I saw a native wearing a loin cloth. We were really out there. After jumping on an army transport vehicle we went up stream past a big waterfall to get in our hollowed out canoe. I had heard we were up for a four hour canoe ride, what I didn’t know was that it was going to be four hours of white water on a hollowed out canoe with a motor! This wasn’t a motor boat. This was a native boat turned into a motor boat. We stuffed all of our stuff for 2 days plus our group of 10 and our two native guides. The first wave, I thought we were going over. I think the canoe was even more rocky than you’re average canoe. We were literally in a log that as hollowed out. It didn’t feel very steady. Our guides knew it. If we put our hands on the side of the canoe it was enough to throw off the equilibrium. Ask anyone who rode in our canoe, during the first couple of hours they had to yell at us every few minutes to make sure we kept a low center of gravity. Getting bashed by cold waves over and over did much to make us listen to every warning from our guides. 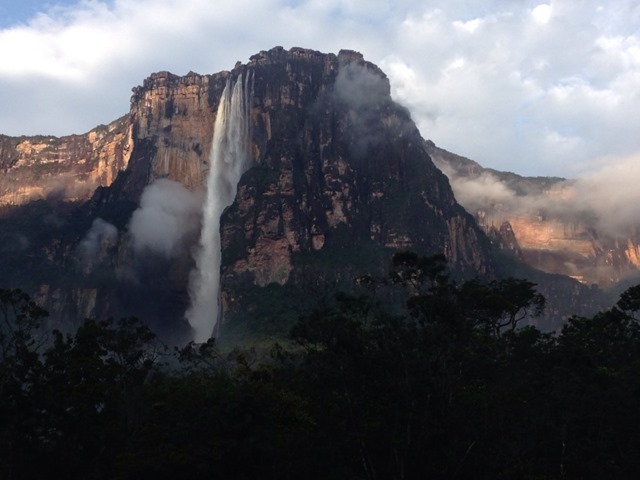 Land of the lost… A view of Angel Falls from the other side of the river where we were camping… we woke up to this. There wasn’t anything on our cold soaked bodies that was dry. I had prune hands and feet by the time we reached our destination 4 hours up the river. I later learned the conditions were right for us to make such good time. The river was high due to lots of rain. What I missed out on mentioning was the fact that as we sped up the river getting drenched with whitewater, we saw some of the most incredible views of waterfalls coming down from high plateaus rising up from the plains. The terrain changed from sparse forest to thick dense jungle. Our guides informed us that the peninsula we saw was over 700 Sq Km at the top and rises over 3000 meters from the ground to the top. The terrain itself is a thing of stories. From the stories of a land where dinosaurs still live to a place where an old man flies his house on balloons. It was also part of the stories of El Dorado in search of the cities of gold. This place is so inaccessible, it is the place of stories. 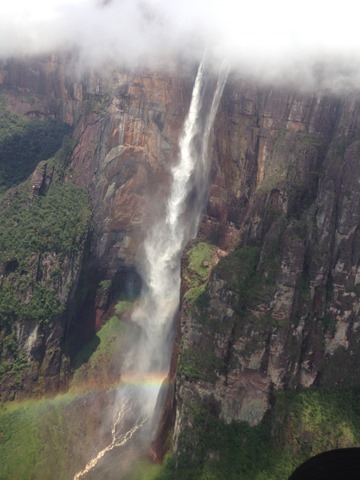 The reveal of the world’s tallest waterfall was scintillating. When I realized what it was and had it confirmed by our guides, our boat was a flutter with video, cameras and phones clicking snapping as we all hoped the waves would stay at bay while we got shots of a lifetime. 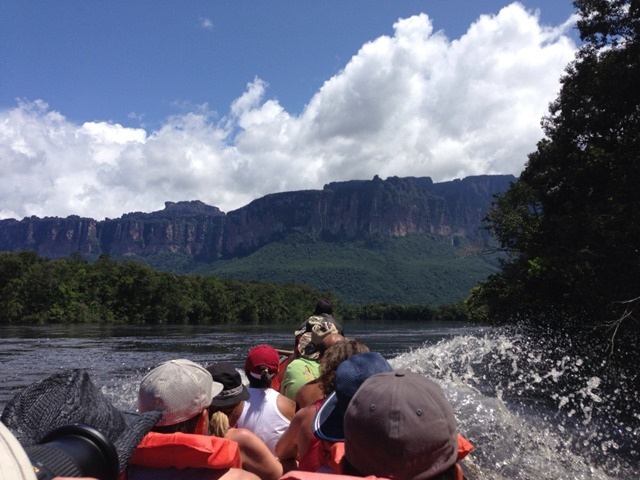 Within minutes the boat stopped, and we started a hike across streams and small rivers up the mountain toward a vantage point to see the best of Angel Falls. A five mile hike with wet feet and wet clothes. My friend Michael did the hike barefoot as his flip flops broke early on. I was wearing knock off crocks that I bought for about the equivalent of $5 back in the camp. It worked out for me. The hike was pretty wild. I was looking for jaguars and monkeys, but ultimately I missed seeing any significant wild life. On the way down, the trail got darker and darker. Most of the group had head lamps. Despite the new batteries I put in it, they were dead when I found it at the bottom of my bag and the light was switched to on. I wouldn’t find out until our guide brought down the last group that he saw a 3 meter (10 feet) long boa constrictor! That night we slept on a dozen hammocks slung up next to each other displayed in what looked like a wedding chapel. Swinging just a little, you’d bump into you’re neighbor and we were a cozy bunch… That is until the next morning when I found out that I slept like a log when I laid down. Apparently I was snoring (I hadn’t really slept in two days) and made it a bit of a challenge for a few of my new friends… which made it a bit uncomfortable over the next couple of days. I guess the snoring was a bit of a joke in camp. It kind of felt like a summer camp after 3 days with these folks. I’d like to share more of our experience on this trip, but I don’t want to detract from the falls… What an amazing falls. After we got back down closer to canaima we had the opportunity to do some smaller hikes including one behind a HUGE waterfall. That as well was truly incredible. Another night on hammocks with the option of a room or bed… I think I got bit by something even though I was sleeping in a mosquito net. Strange. 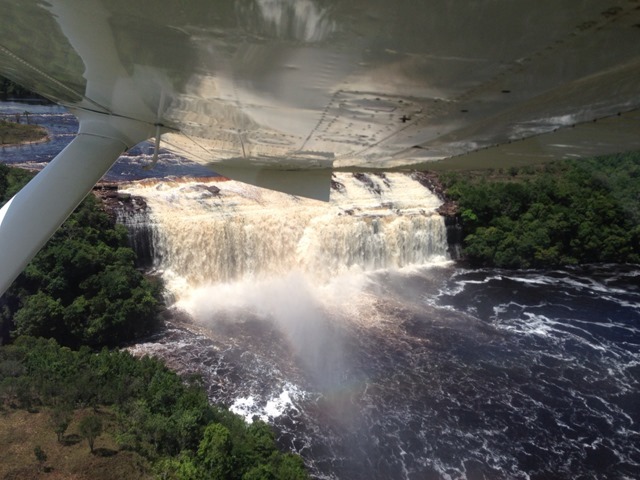 The final day we had the option of taking a little flight up around the falls. 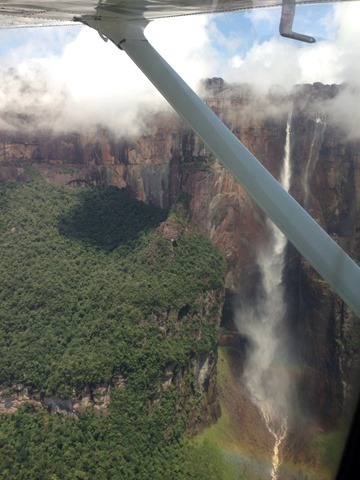 Doing the fuzzy math with the cheaper exchange rate, it came to around $50 to go fly in a 6 seat plane around Angel Falls. I convinced my friends we should do it. Another amazing add-on and this was the best $50 spent in a really long time. It was incredible. After we got up we had some amazing views of the falls. With four passes, twice each window and a rainbow, and a different view each time… we got some amazing shots! More stories to tell… but I really want to get these amazing pictures shared… We walked behind this falls!